On an outing to Tommy Thompson Park, Bob and I were in search of American Woodcocks in the Wet Woods, several having been sighted there a week earlier. 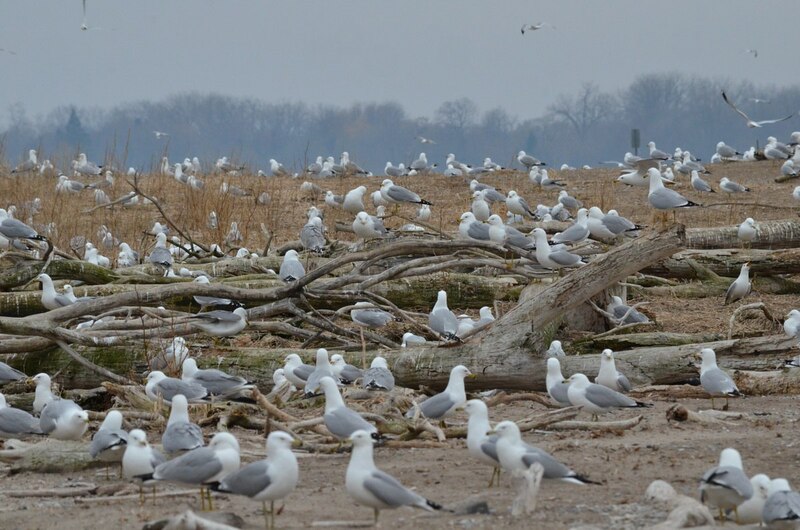 Although we only managed to flush a couple of those elusive birds, we certainly had no trouble photographing some of the thousands of Ring-billed Gulls (Larus delawarensis) that had congregated at the Ring-billed Gull Colony at Tommy Thompson Park. 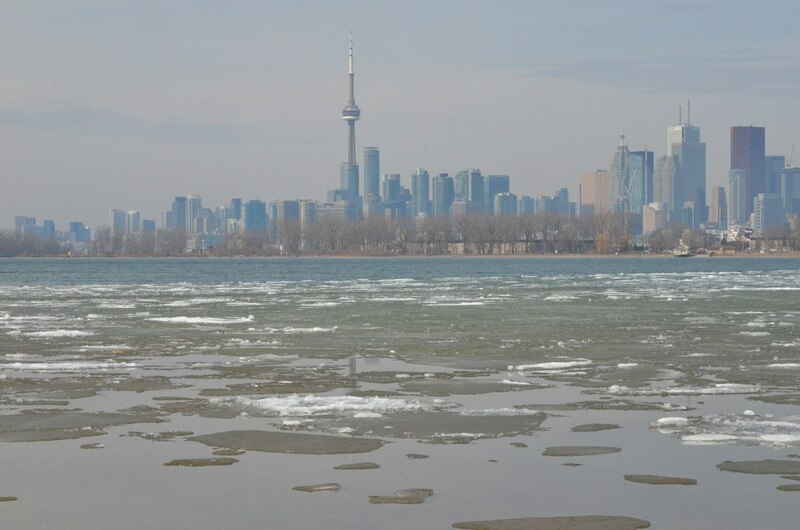 Tommy Thompson Park is located on the Leslie Street Spit, an extension of Toronto ’s lakeshore that is within sight of the urban core. It was early spring when Bob and I spent one whole day trekking all over that peninsula in search of some of the first returning spring migrants. Despite it being a holiday weekend, we found ourselves the only two people on many of the walking trails. We had elected to explore the lesser-traveled paths so our experience was very rewarding in that a whole new side of Tommy Thompson Park revealed itself to us that day. As we patrolled the secluded trails, the raucous screeching of the Ring-billed Gulls filled the air even from afar. As Bob and I drew nearer the water’s edge of Peninsula B, the sight of so many Ring-billed Gulls had us in awe. Never before had we seen so many assembled in one place. 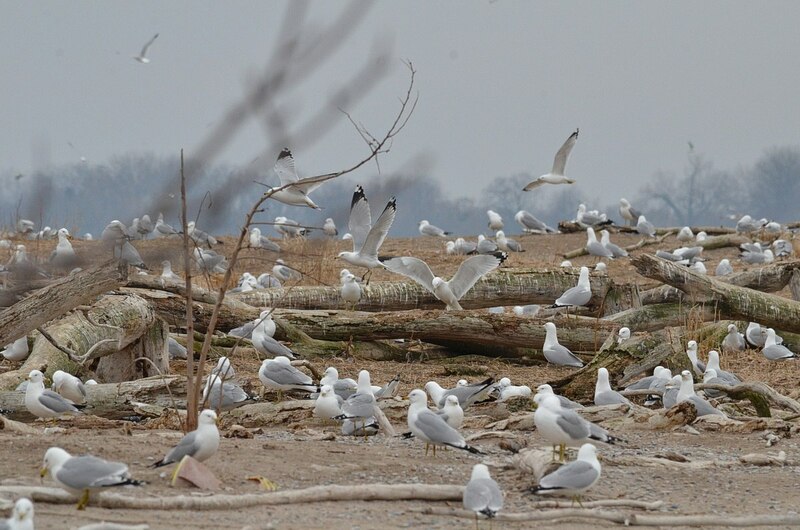 It is said that Toronto hosts a breeding colony of about 55,000 pairs of these Gulls, or 6 percent of the global population at the Ring-billed Gull Colony at Tommy Thompson Park. 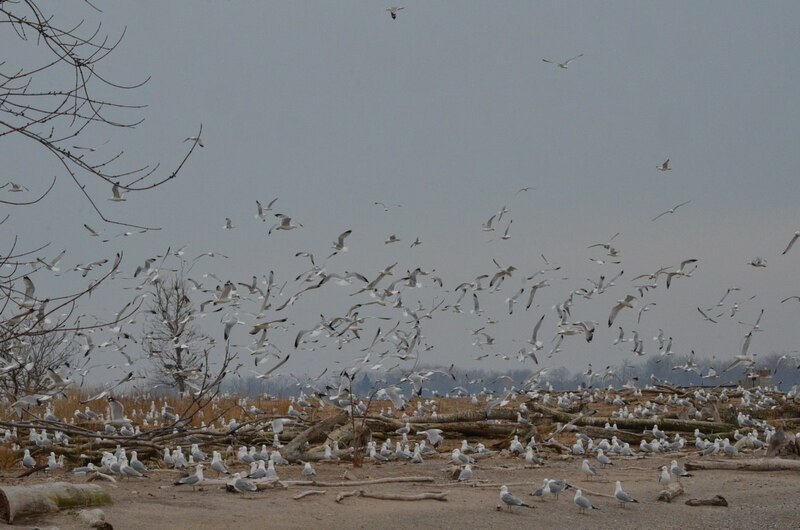 That is a lot of Gulls! There were so many Ring-billed Gulls that I hardly knew which one to look at. 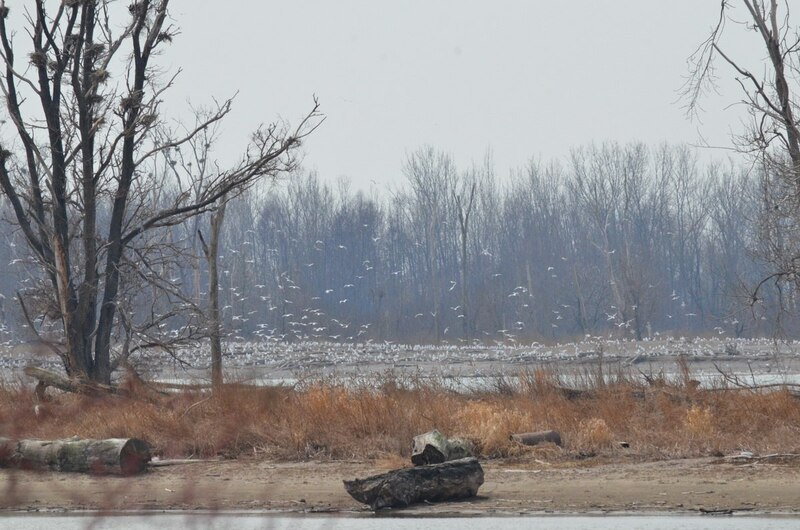 All of these Gulls have returned to breed at Tommy Thompson Park because, in all likelihood, that is where they themselves hatched. It is even more surprising to learn that a breeding pair will return to the same nesting site year after year, often setting up shop within a few feet of the previous year’s nest. 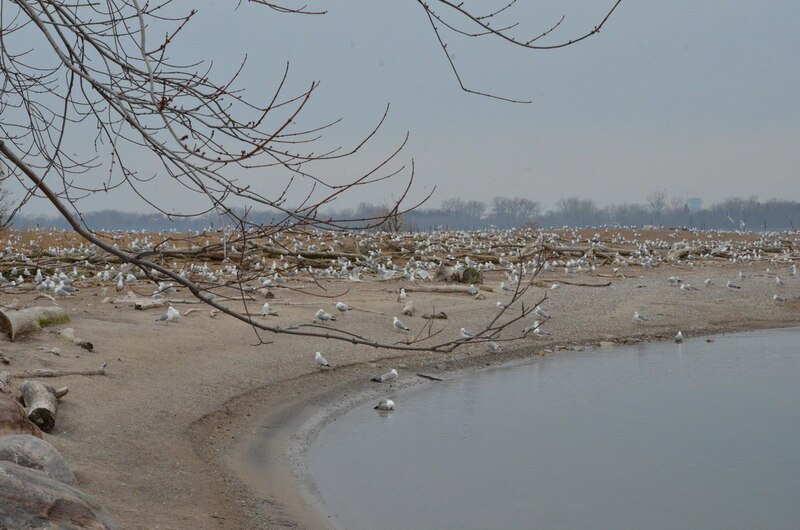 Because Ring-billed Gulls form large colonies during breeding season, they begin to return to the nesting site as early as March, even though actual breeding takes place between May and August, in order to establish their territories. Despite being highly social birds, they will fiercely defend their small territories within the nesting colony. 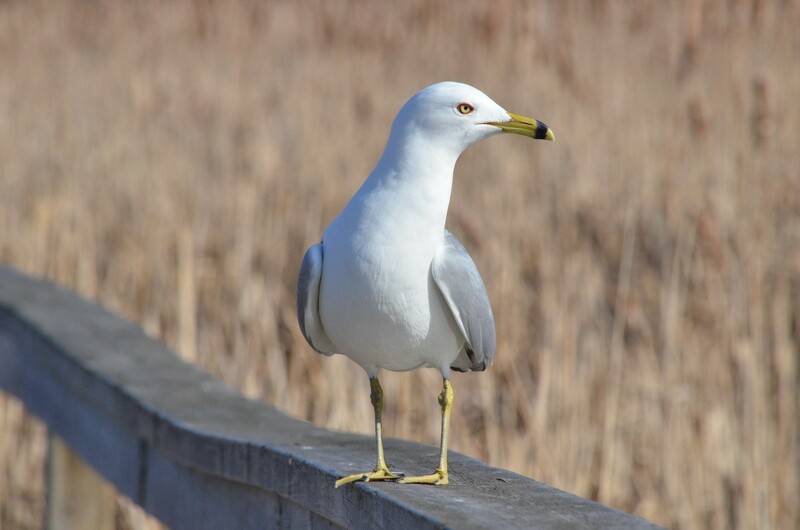 This Ring-billed Gull was photographed at Lynde Shores Conservation Area in Whitby , Ontario, a few days prior to visiting Tommy Thompson Park. Being quite accustomed to birdwatchers at that location, the Gull allowed us to approach within a few feet. Ring-billed Gulls are medium-sized Gulls with a rounded head and a fairly short, slim bill. 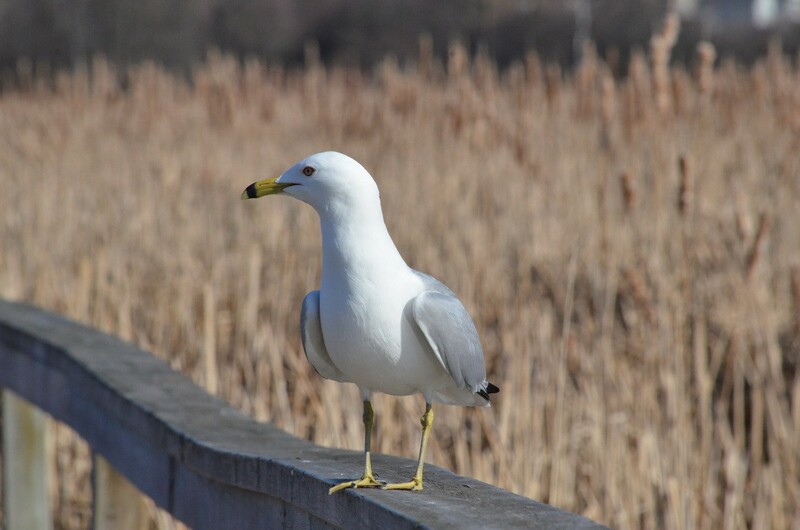 An adult Ring-billed Gull has yellow legs and a bright yellow bill with a black ring around the tip. and the black wingtips have large white spots called windows or mirrors. Add to that bright yellow eyes set off by a red ring, and you have a a Gull with a very fierce countenance and striking appearance. These birds are about 40-50 centimetres (16-20 in.) 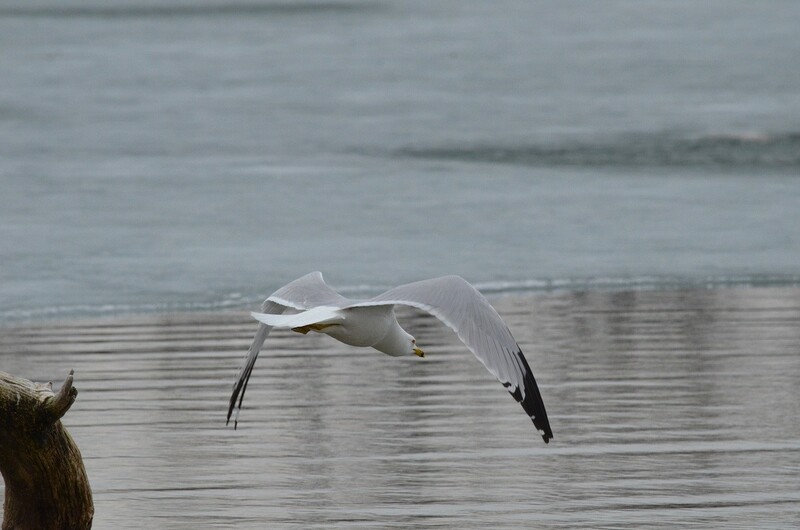 long, and when perched, a Ring-billed Gull’s long, slender wings project well past the end of its tail. 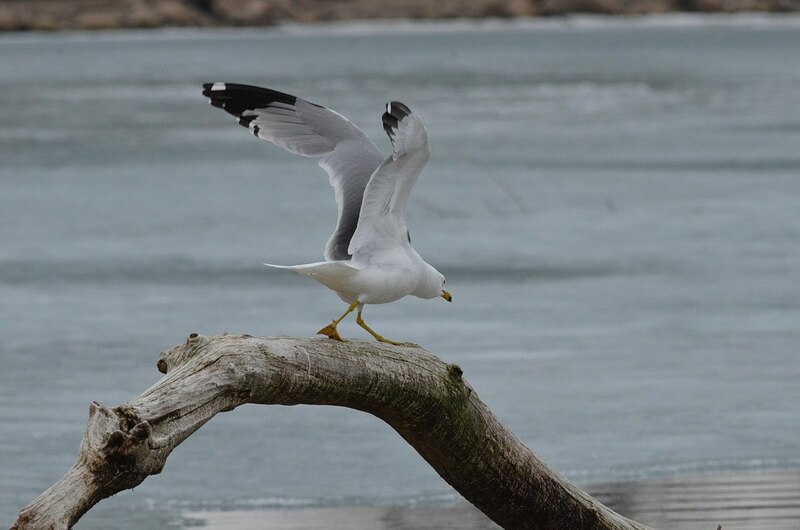 As this Gull prepared to take flight, I got some indication of its square-tipped tail. When fully extended, the wingspan of a Ring-billed Gull is about 1.25 metres (4 ft.). 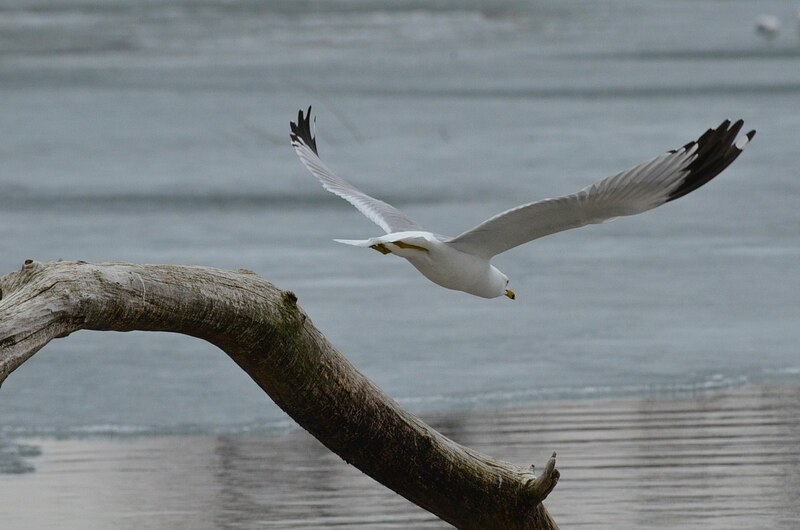 Moving with easy flaps, a Ring-billed Gull will swoop and soar as it forages for food or tries to drive away predators. 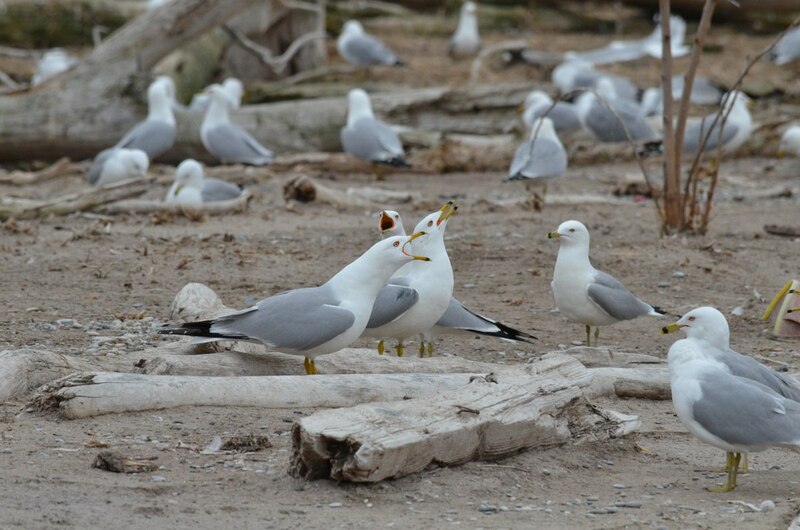 Ring-billed Gulls will eat just about anything…fish, eggs, rodents, insects, human food, mussels, vegetable matter, amphibians…and are not against stealing food from other birds. On the reverse side of the coin, predators that threaten these Gulls and their eggs include mammals such as foxes, skunks, weasels, raccoons and minks, California and Herring Gulls, Great Horned and Snowy Owls, Crows and Ravens. 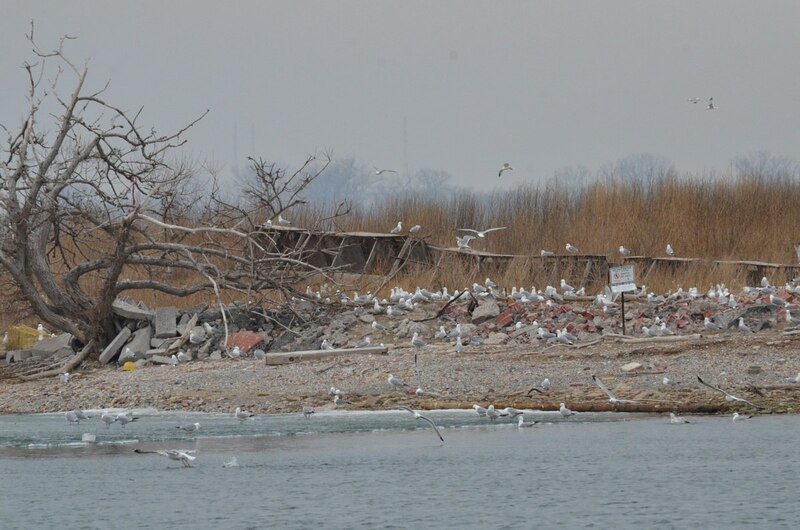 The fact that the breeding Gulls nest and feed in a large colony such as this one at Tommy Thompson Park means that each individual Gull can rely on all the others to send up the alarm if predators approach, or panicked Gulls taking flight will alert others to any imminent threat. Alfred Hitchcock’s movie, The Birds, came to mind when I learned that Ring-billed Gulls will assault a predator en masse to drive it away. 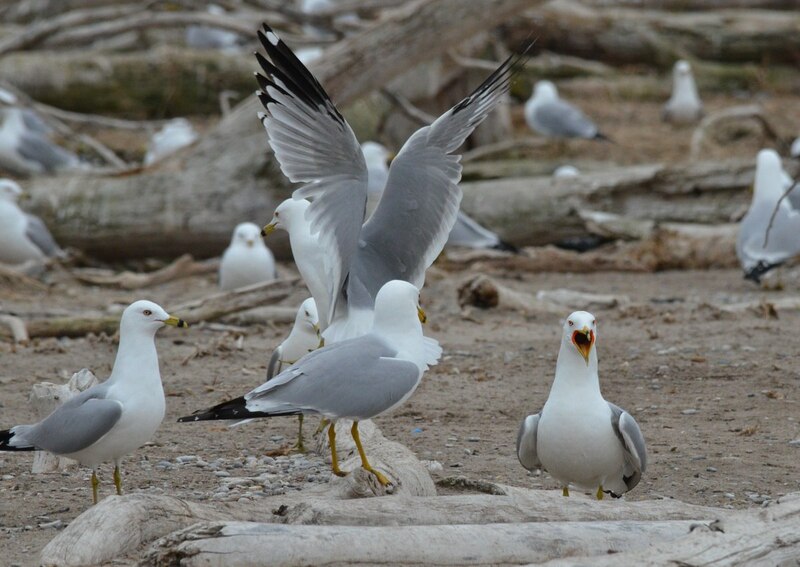 That’s not to say that Ring-billed Gulls don’t take to the air just for the pleasure of it. They are quite playful birds, too, that will actually drop an object from on high so they can swoop down and catch it in free fall. Drifting on the wind currents, these Gulls moved with abandon between the two large bodies of the colony that are settled on Peninsulas B and A. Bob and I were unsure as to the reason for the wooden structures, one on each point of land, that were quite ramshackle in appearance. Were they constructed as blinds for bird observation or as some means of shelter for wildlife? They seemed incongruous with the remote surroundings and restricted area. Ring-billed Gulls, at any time of the year, possess quite a repertoire of vocalizations, mewing calls and laughing sounds, high-pitched screeching and shrill squealing. Bob and I were witness to considerable aggression demonstrated by Gulls protecting their mates from contenders. A Gull would lower its head towards its feet then throw its head backwards at the end of a squawking call. 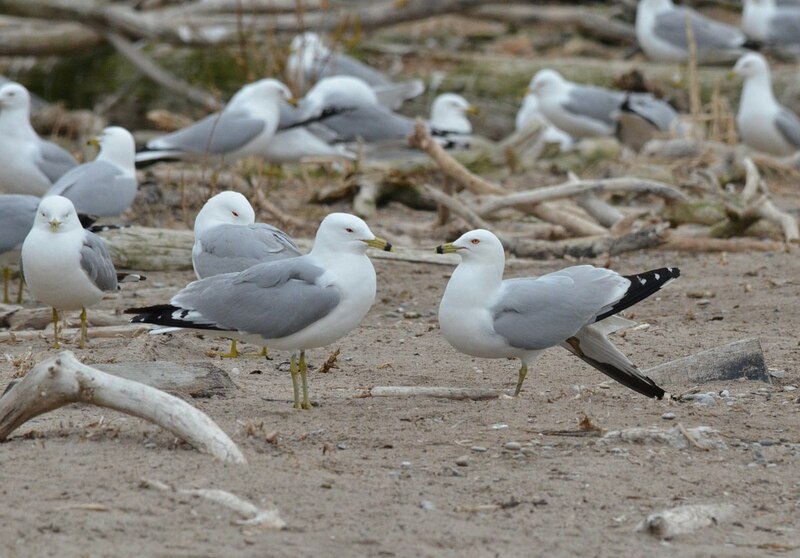 Ring-billed Gulls are widespread across North America and breed across a wide section of central and southern Canada as well as in the northern United States. By late June, the populations start to disperse and head south to their wintering grounds between southern United States and Central America. Though often considered nuisance birds, Ring-billed Gulls are really quite helpful as scavengers in harbours and bays not to mention everywhere else that endless amounts of human food waste accumulates. In the Great Lakes area, these birds were once nearly hunted to extinction for their feathers that were used in the millinery trade and for their eggs that were a source of food, but they also were the victims of human persecution. It has only been since the 1960s that their populations have rebounded, and we can be thankful that we now see them thriving on interior, freshwater lakes. 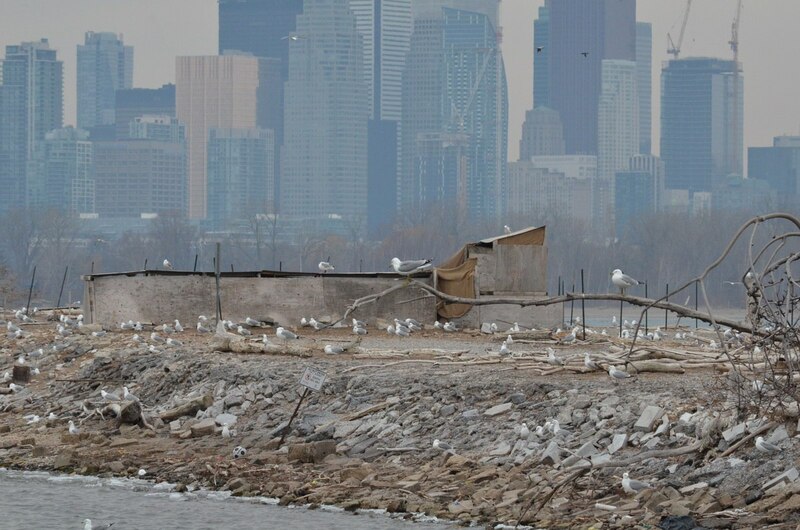 Unless you visit the Leslie Street Spit during breeding season, however, I doubt that you will ever see so many Ring-billed Gulls gathered in one place at one time.